Given the furore about the latest Hugo list, I thought I would post here my one and only review of a book by John C. Wright. The review appeared in the New York Review of Science Fiction 188, April 2004. Space opera is that offshoot of science fiction that comes closest to pure heroic fantasy, and nobody notices. Tactfully we look away, as if slightly embarrassed, from the quest format, the hierarchical social structure, the pseudo-medieval titles, the magical sleight of hand. We remember Arthur C. Clarke’s dictum – any sufficiently advanced technology is indistinguishable from magic – but we laugh and shrug and try not to think about what that actually means. Then we tell a story of wild adventure that is set amid the pristine stars, not on a dirty medieval world; that features big engines not supernatural beasts; that is peopled by mad scientists or rogue supercomputers rather than black magicians; and we kid ourselves that this is the true quill, sf as it was always meant to be. 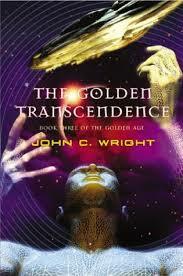 John C. Wright, in the trilogy that concludes with The Golden Transcendence, has written an out-and-out fantasy full of cloaks of invisibility and magical armour and metamorphoses and brave young heroes on a quest to achieve their birthright and evil wizards. But he gives most of these scientific-sounding names so it’s science fiction, okay? He even loads the ship up with mythical resonances, like any fantasy aiming for a bit of credibility. Our hero, for instance, is Phaeton, the charioteer of the sun; his marvellous ship is the Phoenix Exultant, named for the fabulous bird that was reborn in fire. And in those two names alone we have practically the whole of the plot of this novel. But let us not get ahead of ourselves. We begin this concluding volume with a dead Phaeton being painfully resurrected – a phoenix himself, or so it seems – and in the moment of resurrection he learns that his precious ship is about to be invaded. What follows – occupying the first five chapters, roughly one third of the book – is the story of that invasion, which comes down to a straight duel between Phaeton and the entity who personifies the invasion force. With the ship accelerating at incredibly high rate, the two antagonists are immobilized by gravity. This scene irresistibly reminds me of the duel between the two magicians in Roger Corman’s creaky old horror film, The Raven, each side casting spells at the other, though in this instance the spells take the form of computer viruses and disinformation. Wright uses the duel to provide a lot of background information. We learn, for instance, all about the post-human civilization that was established on Cygnus-X during the era of the Fifth Mental Structure (a homage to Olaf Stapledon?) and which has developed differently from the Golden Oecumene (take a bow Ursula K. Le Guin?) that has developed in our own solar system. At times, this Second Oecumene (a nod to Isaac Asimov?) is the blackest villain; at other times it is the secret haunt of the good guys. Eventually Wright settles for them being the bad guys, and our superhero proves impervious to all the weapons thrown at him. The invader is quashed, at which point it is revealed that Phaeton is not Phaeton but the Golden Oecumene’s one and only soldier, Atkins (presumably named for the archetypal British soldier, Tommy Atkins – ‘the names, the names’ as Mr Kurtz might have cried. This whole battle by the way, all five chapters of it, has taken minutes at the most. This dichotomy between the elapsed time of what is happening and the time taken to tell of it illustrates a problem with Wright’s book. We have, in contemporary space opera, become used to objects of immense size and to huge events that take ever smaller measures of time; this, after all, is the magic of how we imagine the distant future to be. But though Wright can manage the grandeur necessary for us to experience the sheer scale of what he describes, he simply cannot manage the pace that would give us any clue to the speed of events. In fact, the faster things happen, the slower his narrative becomes. This isn’t helped by his insistence on repeating everything three times, on telling us the same things over again in slightly different language or from a marginally different perspective, on hammering home the obvious by sheer persistent repetition. One can’t help feeling that if he had pared his work down to a single iteration of what needed to be said, this might have been a mind-blowing visionary novel rather than an otiose trilogy. And if pace lets Wright’s work down, dialogue defeats him totally. I would not need the fingers of one hand to count the instances of what might pass for normal conversation between characters in this book. Rather, the characters take turns to make speeches at each other, often on topics or heading off in directions that bear no relationship to the speech just directed at them. In other words, nobody appears to listen to anybody else, nobody appears to act upon anything they are told, and nobody appears to interact with anybody else. Given that the speeches are composed in equal measure of bombast and babble, the air of inhuman sterility that hangs about this work is dense and suffocating. What is done poorly, in other words, is people; what is done well, on the other hand, is things. Wright loads his book with spectacle: the vastness of the Phoenix Exultant, the characters shifting between forms, the chill grandeur of Second Oecumene bodies sent to orbit a black hole as a form of suspended animation. And the grandest spectacle of all is the drama at the heart of the second half of this novel, for Phaeton discovers that the enemy has a ship within the sun. The solar charioteer, armed only with a brief bit of computer code, must ride his firebird into the heart of the sun to do battle. The climactic battle ends up as an over-wordy debate during which the antagonists don’t actually move – Wright has an unerring ability to reduce the fieriest confrontation to inertia – but what happens around this stultification is breathtaking. If only Wright could tell a story equal to his vision, whis would have been a mindblowing piece of work.